via our form below or phone us on 01442 385 581. Do use us to make your corporate films or wedding videos, money spent with us helps to support our community TV - do look at what others say on the ‘Spotlight’page! If you would like us to make a film for your web site – just call us, and do watch the short film below. Since launching, DeeTV has enjoyed over 111,000 visitors to the website. People eager to watch our films, with films viewed 123,256 times. We are now entertaining well over 10,000 visitors a month, our audience continues to grow at a phenomenal rate. LET US QUOTE YOU FOR MAKING A CORPORATE VIDEO FOR YOUR COMPANY. We can also make films of special family or group occasions – just give us a ring! WE LOVE CAPTURING THE WARMTH OF A WEDDING DAY – ASK TO SEE OUR FILMS! What does advertising with DeeTV mean for you? Advertise with DeeTV and with every page easily able to carry your advert, we can guarantee your advert will be seen by thousands of people who use our site every month. And with prices starting as low as under £10 per week this is a great way to let your local customers know about your business and services. You will see below that we have numerous options with which to help you get the most from our service. Lets not forget that 80% of viewers go on to view the other pages on DeeTV. 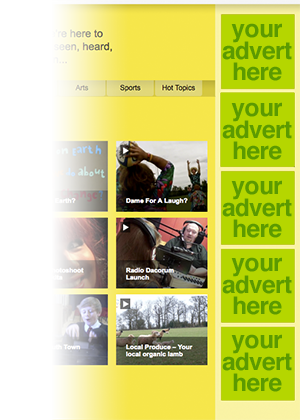 Have your business advertised on all these pages on DeeTV. Our banner ads provide the best performance due to their position and exposure across the whole website. Each ad is displayed for a full 10 seconds and is displayed on every page. Fill in the form on the left or give us a call and start promoting your business, charity or services today – we want to help promote our locality.